Twitter erupted from a photo of the counselor to the president sitting oh-so comfortably in a room of Black leaders. One of these days Kellyanne Conway is going to do something right. But Monday was not that day. The controversial counselor to the president has shown her true colors on more than one occasion from creating the term “alternative facts” to cover up a complete lie, to being barred from news programs for her inaccurate information. But yesterday, Conway was the physical embodiment of wrong when a group of historically black college and university presidents visited the White House. The 50-year-old grown woman was spotted sitting knees bent on the Oval Office couch with her shoes on, trying to take photos with her camera phone. 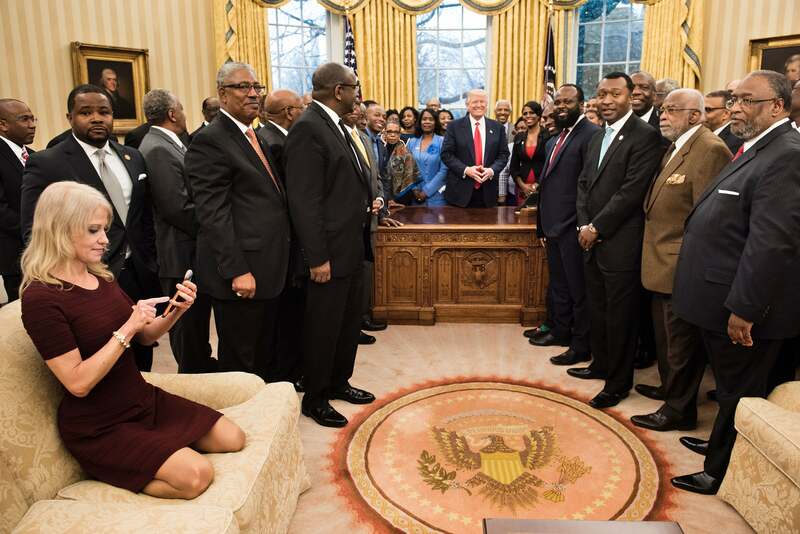 Her lack of decorum sparked an online frenzy as Twitter analyzed the different angles of what-the-hell-is-happening with Kellyanne’s childlike positioning in a room full of Black leaders. Jamilah Lemieux, VP of News and Men’s Programming-Interactive One, made a series of good points about why the photo was problematic. The White House meeting was to push forward an executive order giving federal funding to HBCUs.